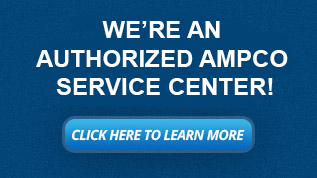 For over 60 years, Ampco has provided pumps for sanitary, marine, industrial applications, food and beverage. Ampco’s stainless steel Positive Displacement (PD) pumps are EHEDG certified and conform to 3A standards. Features of the PD pumps include complete interchangeability with competing models, easy maintenance, enhanced CIP-ability, and in many cases a cost effective alternative. The Ampco Sanitary Centrifugal pumps are highly efficient and heavy-duty pumps, which meet 3A standards. Most L series pumps are hydraulically and dimensionally interchangeable with competing models. Choose the AC or AC+ series for a more cost efficient Centrifugal pump. 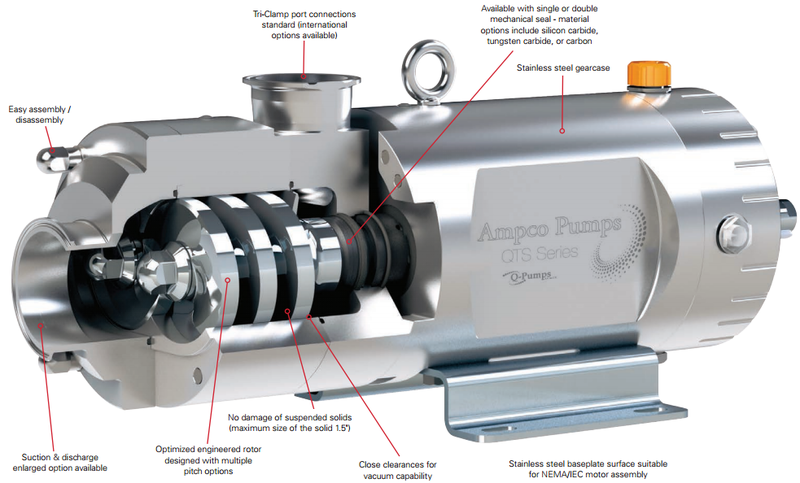 Additionally, the QTS Twin Screw PD pump is a highly diverse pump that offers high laminar flow rates, bi-directional capabilities, solids handling, and complete CIP-ability. For marine and industrial applications, the Z, K and R series can handle seawater and other harsh applications using a wide range of construction materials. Ampco also offers craft brewing solutions with the CB+ Craft Brew Pump and the ROLEC Dry Hop Induction System, perfect for master brewers everywhere. See below for all the Ampco pump products. 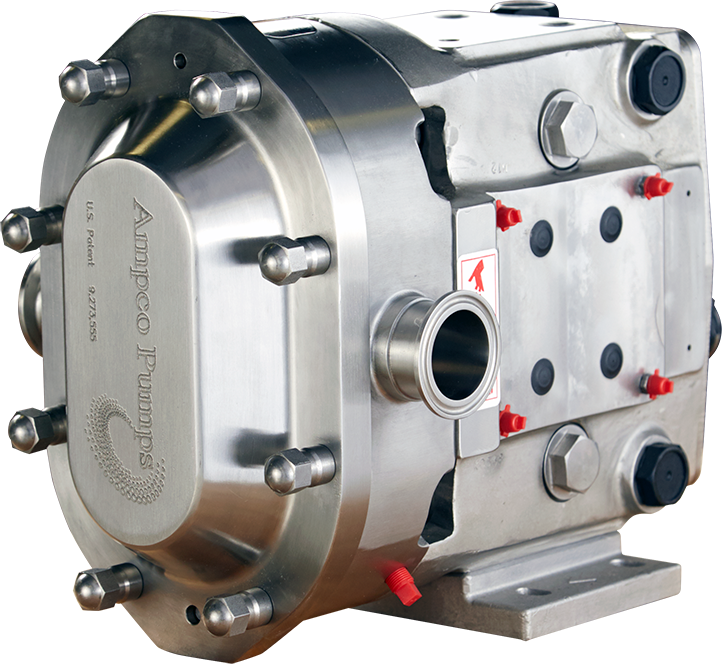 Ampco’s ZP series pumps feature a stainless steel construction, including a stainless splash plate, which protects bearings during the wash-down process. The ZP series also use helical gears, 4 way mounting, and 17-4ph shafts. An advantage of the ZP1 and ZP2 series is the interchangeability with competing models. The ZP2 has a larger shaft and cleaner rotor nuts making it CIP-able. The ZP1+ has an enhanced ZP1 design making o-ring maintenance quick and easy. Finally, the ZP3 series uses a front-loading seal design to be completely CIP-able and to make seal maintenance simple. In addition, the new rotor design eliminates all dead zones. The ZP3 series is EHEDG Certified and meets 3A standards. The AL series is a rotary lobe pump with a stainless steel gear case and front loading seal design, which enables easy maintenance and enhanced SIP-ability. AL pumps conform to 3A sanitary standards and are EHEDG certified. Seal choices include: double mechanical, mechanical seal with flush, double lip seal, triple lip seal, O-ring and double O-ring. Heating and cooling jackets for temperature sensitive processing are available. Ampco’s L series centrifugal pumps designed for all Sanitary applications and requirements including food and beverage, CIP, dairy, cosmetic and pharmaceuticals. The L series pumps consist of 316L and 304 stainless steel construction and conforms to all 3A sanitary standards. 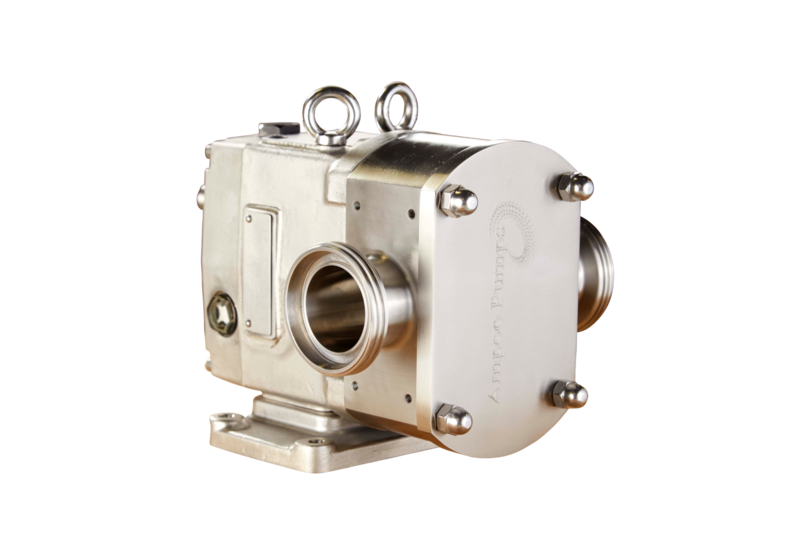 Pump options include LC parts interchangeability, LD double mechanical seals, LF frontloading seal design, LME metric pump, LH high inlet pressures up to 600 PSI. The balanced impellers and tight manufacturing tolerances add to the efficiency of this durable line of pumps. 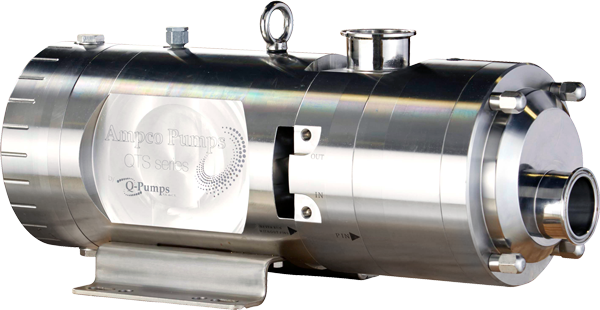 Ampco’s SP self-priming pumps are well suited for CIP return applications as well as drum & tank emptying capabilities. SP include a 304 Stainless Steel adapter, single or double mechanical seals, as well as 3A sanitary standards compliance. 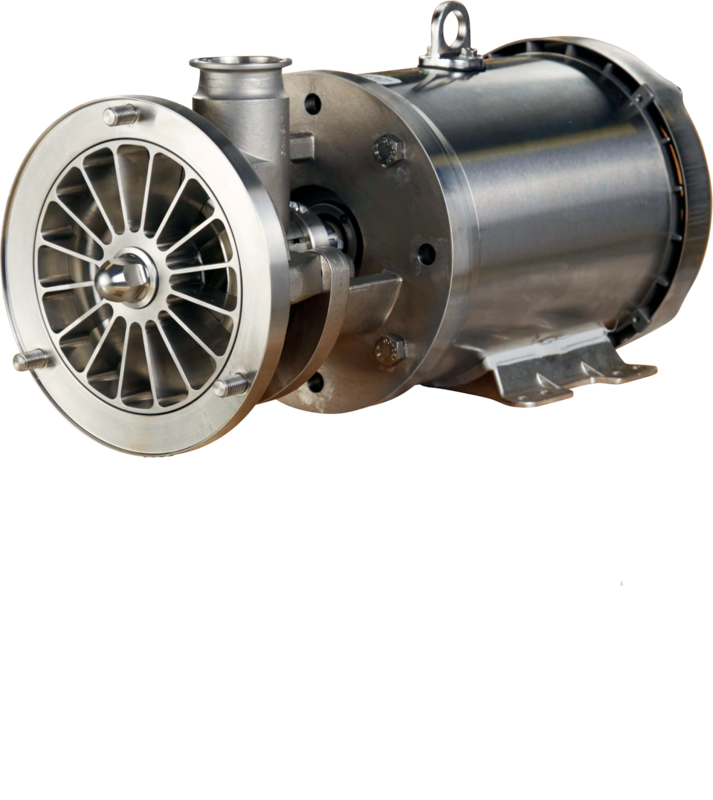 Vane impellers and tight tolerances give SP pump ability to handle fluids with entrained air. Designed to handle entrained air conditions while maintaining specified performance and efficiency levels. 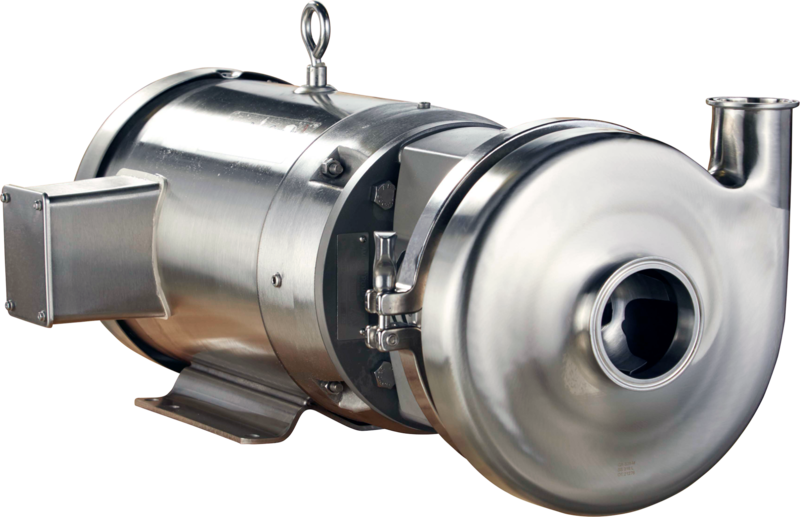 The QTS is a versatile twin screw PD pump that has bidirectional metered laminar flow capable of handling up 60% entrained air and abrasive products. The QTS can move delicate products without damaging them. There are multiple seals and screw pitch angles to choose from for each model and replacements are readily available. The pump that is made from 316L stainless steel is fully CIP-able and conforms to 3A standards. The AC/AC+ series centrifugal are cost-effective pumps designed to fit sanitary applications. Suitable with beverage, juice, dairy and pharmaceuticals, this pump provides competitor parts interchangeability as well as improved characteristics. Built from 316L stainless steel including stainless steel backplate, impeller, and stub shaft along with 304 Stainless Steel adapter. Hydraulic characteristics and external dimensions are maintained for ease of replacement. The AC/AC+ Series is a true centrifugal workhorse. As a division of AMPCO METAL, Ampco Pumps began producing industrial centrifugal pumps for saltwater applications in 1948. The first pumps available were the Z, K, and R Series in nickel aluminum bronze. 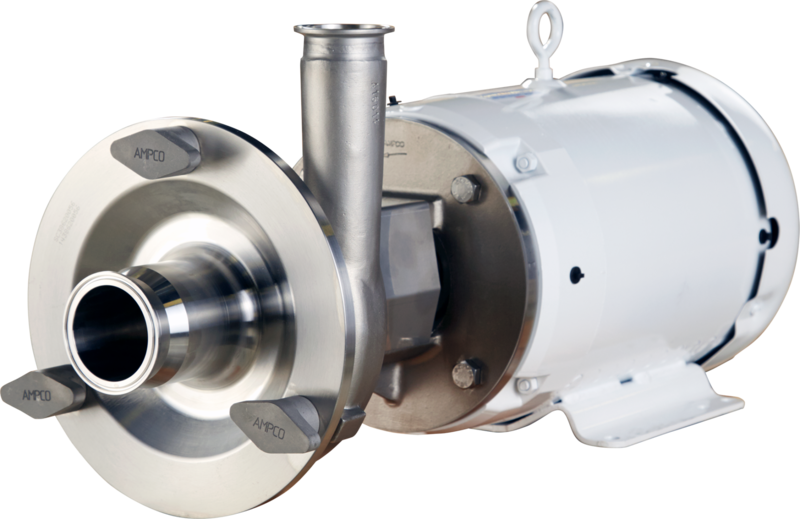 Now nearly 60 years later, Ampco offers a variety of specialty pumps including the Z Series, K Series, R Series, IC+ Series, AL Industrial Series, ZCM Series and D Series designed to match highly corrosive, ABS approved, and industrial applications. Z Series high flow pumps shine in applications where corrosion resistance is of the utmost importance. K Series high efficiency pumps have NPT threaded connections and are close-coupled to NEMA 56J frame motors. R Series self-priming marine industrial pumps are capable of self-priming up to 25ft/7.6m. IC+ Series centrifugal pumps are a cost effective solution for industrial applications where cast iron pumps are not recommended. AL Industrial Series rotary lobe pumps has a 316L Stainless Steel construction and non-contacting lobe design. ZCM Series is the metric version of the ZC2 Series and is built using IEC B35 motors that are CE compliant. 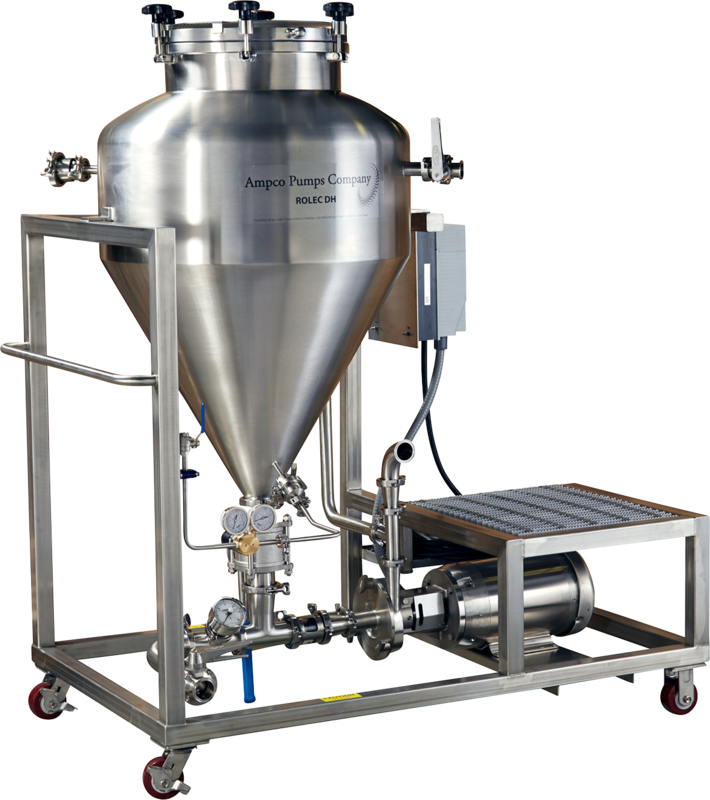 All Ampco products are designed to deliver greater efficiency, enhanced performance, and simplified maintenance for brewing and dry hopping. The ROLEC DH, Wine & Must Cart, Cellar Cart and CB+ Craft Brew Pump are all ideal for small to mid-size craft breweries. ROLEC DH: The ROLEC DH45, ROLEC DH90 and ROLEC DH250 models offer small to large scale breweries a safe and efficient way to dry hop beer. The ROLEC DH units are not just for hop induction, they can be utilized to induce fruit, coffee, spices, nuts, honey, maple syrup and more. The induction options are limited only by the brewers creativity. CB+ Craft Brew Pump: Specifically designed for the craft brewing industry to allow brewers to focus on creating their next signature beer rather than deal with leaking pumps. Available in 8 model sizes, flow rates up to 920 GPM, can handle pressures up to 130 PSI and has a max viscosity of 1,200 cP. Cellar Cart: Made up with an Ampco AC+ Series Pump, 316L Stainless Steel Construction, 304 Stainless Steel Adapter, Dynamically Balanced Impeller, 316L Stainless Steel Shaft, NEMA 4X VFD and Polypropylene Wheels. Wine & Must Cart: Made up with an Ampco ZP1 Positive Displacement Pump, NEMA 4X VFD, 304 Stainless Steel Gearcase, 316L Stainless Steel Wetted Parts, Alloy 88 Non-Galling Rotors, 17-4ph Stainless Steel Shaft, Helical Gear and 10″ Foam Filled Wheels. The applications for inline mixers and blenders are limitless. Products requiring the highest shear levels will benefit from the SHEAR-max high shear mixer, capable of mixing and efficiently pumping product with its hybrid impeller design. Lower shear requirements can be met with the SBI or SBH inline blenders. Product options include sanitary and 3A Certification, washdown, CIP-able, chemical duty and more. SBH/SBI: SBH High-Shear Blender is based on the LF Series pump design and offers multiple front loading seal options. SBI Shear Series pumps can move product and create considerable pressure by way of a hybrid impeller. Manufactured and assembled in Glendale, Wisconsin. JET-shear: Emulsion to less than 10 microns, max volumes up to 1000 gallons for self-mixing, Stainless Steel mixer shaft, mixing heads can be interchanged, designed to 3A, CIP-able and multiple mounting configurations. Ampco’s PM Systems encompass a line of products designed to mix and blend powders with liquids efficiently while improving the texture and dispersion of the finished product. These mixing and blending systems are serving industries world-wide including food and beverage, chemical, health and beauty, bio-pharmaceutical and industrial applications. All PM systems are sanitary and 3A Certified. 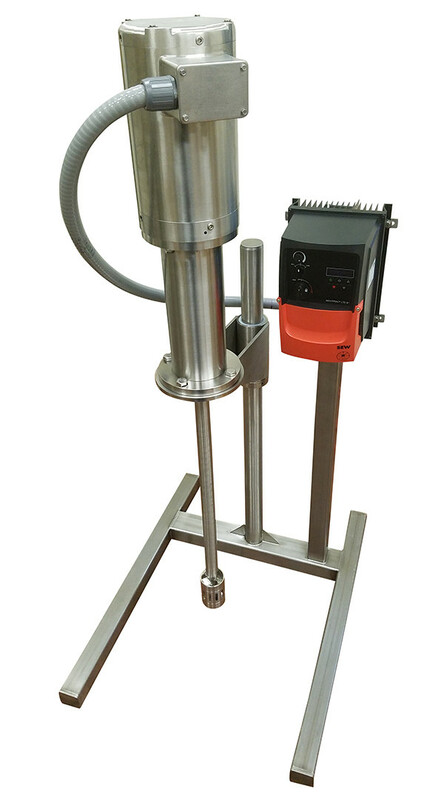 POWDER-max: Model SP Liquid Ring Pump, Model SBH Shear Blender, 304 Stainless Steel Base Material, 316L Wetted Parts, Dual Motor Starter – NEMA 4X, Stainless Steel Casters, Powder Control Valve, Fluid Control Valve, 5 Models. SIMPLE-blend: Model SP Liquid Ring Pump, 304 Stainless Steel Base Material, 316L Wetted Parts, Motor Starter – NEMA 4X (VFD Upon Request), Stainless Steel Casters, Powder Control Valve, Fluid Control Valve, 1 Custom Model. 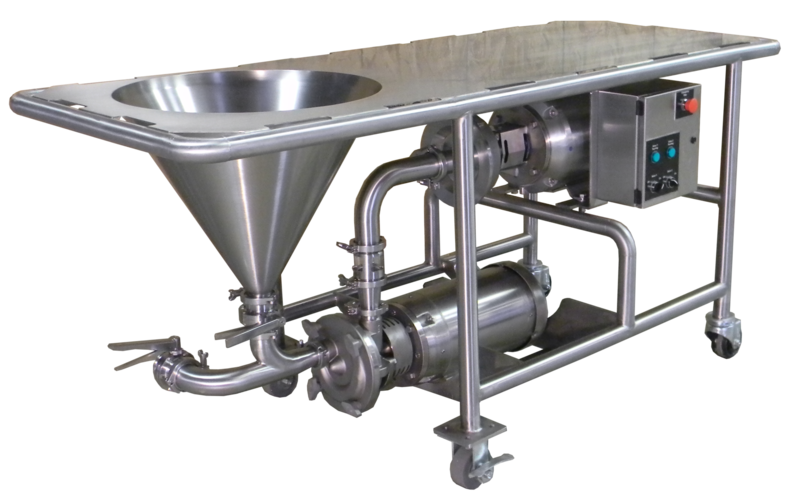 DRY-blend: AC+ Centrifugal Pump, 316L Stainless Steel Wetted Parts, Customizable, Carts, Tables, Belt Drive with Base, Controls, Easily Integrated into Existing Process Systems, 4 Models. SHEAR-blend: Combination Integrated Impeller and Dynamic Shear Teeth, Pump and Blend in a Single Stage, Cast and Machined, 304 Stainless Steel Adapter, Dynamically Balanced Impeller, 316L Stainless Steel Shaft, 2 Models.